I just uploaded the final versions of the ebook files to Amazon and Smashwords, which means that I finally have the official cover to share instead of the low-res version I previously had. So here it is (and you can click on the image for the full 4 MB version of that if you want to). As ever, credit goes to James Taylor, at least for the front of the book. Pre-orders remain open - here it is on Amazon, and here on Smashwords (where it's available only in epub format because of some idiosyncratic rules on file size; the Amazon .mobi is DRM free, however). Print will be available to order sometime next week, with a slim chance of it being up in time for last minute Christmas orders. I'll post again on the 26th when it officially launches with a more substantial musing on the book, but I think it's pretty much the best one I've written. That is a gorgeous cover. 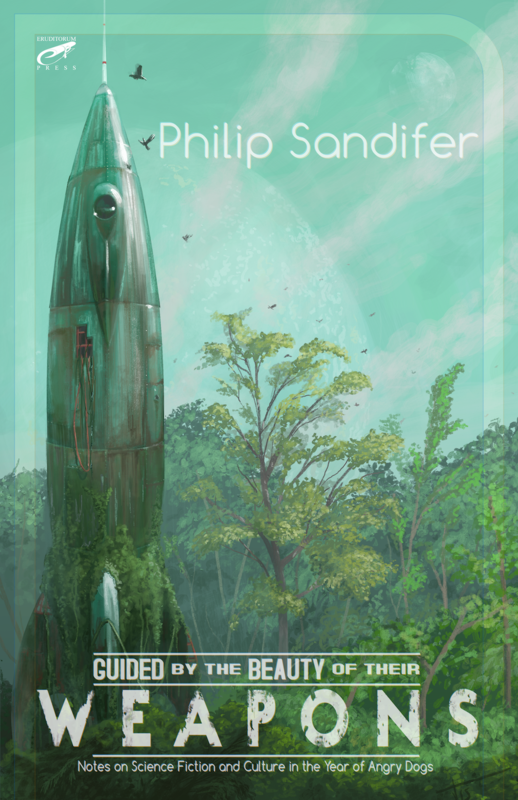 So, this book is about, what, finding an ancient spacecraft in the middle of the jungle? The amazing derring-do it takes to get it up and running? The heroic strength and bravery of a test-pilot to launch it back into space? I do have a headcanon story to go with the painting, and in fact my intention is to eventually expand it to encompass some of that (not in time for the book launch alas - too many things came up at once to allow for it). For the purposes of the cover though, it's entirely allegorical. Would this be one of the ebooks Patreon backers get automatically, out of curiosity? Yep. All Eruditorum Press books to Patreon backers. Do you think Vox Day will write a rebuttal book titled ‘Futuristic Literature Isn’t What It Used to Be’? Who was it who said "Marxism is teleological so we demand each book only have one chapter 5, dammit." Note #1 to self: I need to register to vote in the Hugos this year ASAP. Note #2: Figure out what category James best fits in, because his covers have been consistently amazing. I doubt I'd have any chance of winning, but if you're serious I think the relevant category would be Best Fan Artist. Phil does give me a nominal fee for the covers, but not what is considered a professional sum (and as a fan I'm fine with that, which is why I'm still doing them). I may not think you have that much chance of winning, either; but I'm absolutely serious about wanting to nominate you because I believe your covers are amazing enough to deserve it.